All Forums >> [Artix Entertainment Games] >> Portal Games >> =PG= Bug Reports Go Here! 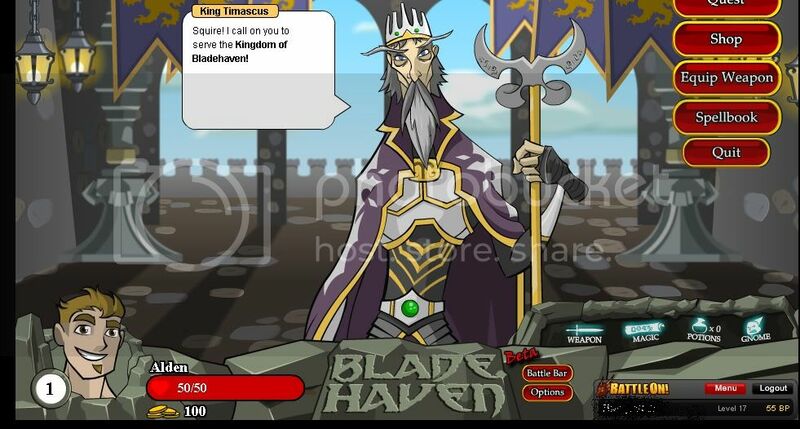 *Important Notice* When taking a screenshot please be sure to edit out your BattleOn Portal Account name at the bottom right of the screen. You and only you should know that information. If your bug report is about being set back to level 1 even though you saved your character at a different level, please read question 3 in the FAQ. This bug is now fixed, but if you saved your character before it was fixed, all that would have been saved is your achievements and your licenses. If you want your character restored, send an email to [email protected] with your master account name (note: password isn't necessary) and a description of your Bladehaven character. 4) Can you provide a screenshot? If you can abuse the bug you're reporting, do NOT post it in this thread. What you should do then is send the bug report to one of the Portal Games ArchKnights, and they will pass the information on. Please include details - where were you? What did you do right before the bug happened? What happened? What flash version is your computer running? What was your Operating System? Do you use Windows 7, Linux, Mac OSX or any other operating system? Duplication: Were you able to duplicate (did the bug happen again?) after clearing your cache? What the bug is: Well, I'm not sure if this is an important bug, but sometimes when I have my shield up and the monster hits me, the stamina bar runs out, but the shield stays up. It doesn't block attacks anymore after this happens and I can attack, but it's really annoying since I can't see when the opponent is going to attack. The only way to work around it so far is to wait for the stamina bar to fill up a bit, then press space bar. This opens up the shield again, and when you let go of the space bar the shield goes down. This has happened mainly against bosses but also againt the bull monsters in the fouldoom place. What happened after the bug?Well I lost my fight against the boss :P Other than this the game worked fine after the fight. What the bug is:I ranked up to level 10, then after i got some BP to buy some more things in the game. When I went back to playing Bladehaven i was level 1 and had none of my items. I have all the achivements of the stuff that I've earned. But I dont have anything in the game. My user name is Akoex. If you look me up you can see I have the level 10 achivement. What happened after the bug?Nothing happened I just logged back in and it showed I was level 1 with nothing. Able to use two gnomes by going to one place and running away.Then I go to another place and summon another gnome.The other gnome I summoned carries onto the next battle.What happened after the bug? Sucessful battle and gnomes disappeared after finishing attacks. Equips: I got all spell and use Shield a lot and i'm lv 7 using non payment axe. I saved. I use Master acc on my brother house and even I logged in, I still can't load. It says: you must log in to load save or kinda, i can't remember. Also there's no small board telling my Point and Exp, level. What web browser did you use when playing? Google Chrome newest version since i just newly downloaded it. According to Warlic, the save bug has already been fixed. You must have saved before it, unfortunately, you're going to have to start off from scratch. There's nothing we can do, though, it is a minigame so it wouldn't be that hard to get back to where you were with your BP. Yes, I did and it said, "Character is already loaded"
Equips: I have all knight weapons without the last 3 + all apprentice spells. What the bug is: Same as YellowPinoyNinja but with poison strike spell. It happens not only when u run away but when u cast the spell when the monster has 1 hit left and when u join another battle the poison spell is still active and does damage. What happened after the bug: nothing i just killed the monster and thats all. Screenshot: i think i don't need a screenshot its the same as YellowPinoyNinja but with poison spell. My guy got set back to level 1 when he was level 10 and had everything bought.It happens when i get off of it for long time, like an hour.This has happened before to me and u know i got level 10 cause my master account level is up for getting achievements. I could get back on and nothing happened and i got back to level 10 the first time it happened and now it happended again. What the bug is:well i complete it my account with level 10 then i saved it, then i logged out . When i logged back in my account was level 1, and the second thing i did was "LOAD CHARACTER". P.S this happened to me 4 times already. What happened after the bug?all my gold,items, were gone!. sorry this isnt about the game, but i dont know where else to post this. All what I did was reset! I started playing! I did all the quests .... killed the dragon !!!!!! and saved my char! Equips: axe, defualt sheild, poison...? What the bug is: it happens quite alot, and what happens is i go into my spell book and it says i havent got any spells equipped, but when i fight, i have poison, just like i thought i did. i went into a battle and managed to use poison. Not every click and drag is tracked, sometimes resulting in the mouse-click registering outside the playable area. Neither damage or clear miss was indicated. What the bug is: Suddenly, my entire profile reset, while I still have my Achievements. I logged in this morning, and found it as a level one, starting off the game. I still haven't been able to get back to my original state. 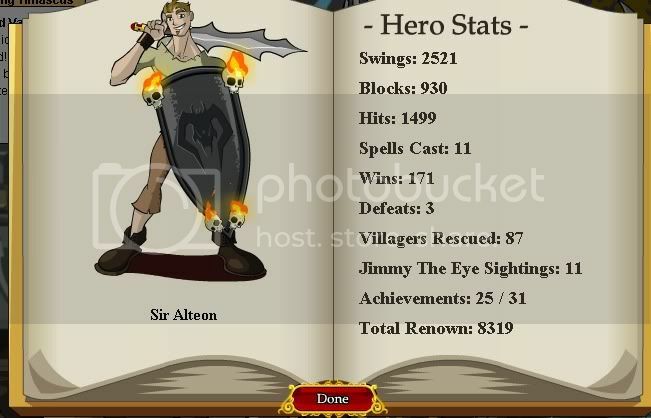 I became a Hero yet there isn't a "Dragon" button over Quest, and My name is not Sir Alteon. This dagger allegedy belonged to the legendary witch, Sally! She used it for slicing fancy cheese appetizers at soirees. The hilt was fashioned from an old broom. Should be spelled Pirate's, like Soldier's Polearm and King's Sword. I've noticed a particular glitch with the Poison Strike if that if you time your hit just right, the damage you inflict with the slash is "copied" by the Poison DoT on screen. While I'm not sure if it affects the actual damage, I'm pretty sure it's not intended. I've only pulled it off a few times by luck, so it'd be a little hard for me to repeat time after time. The fight continued as normal. Sorry, no screenshot at this time. Edit: Managed to grab this picture. It's a little hard to see, but it shows two 11s instead of a 11 and a 8 like it normally would. This stick is even bigger than the Big Stick! Works great for pretend swordfighting! A one-handed axe that is quicker than its heavier counterparts! Great for those with maniacal tendencies! A sword designed for nobility! Looks great when worn with fancy clothes! The long thin blade was fashioned from a prehistoric snake fang! It is designed for speed and reliable damage! This soldiers weapon is designed for fighting on the front lines. It has a very long and deadly reach! A unique sword from a far away land. Its curved blade cuts through anything with ease and is designed for easy swinging. Favored by swashbuckling pirates, this thin-bladed sword comes in really handy when looting booty from unsuspecting shipmates! Forged from the highest quailty royal steel, this sword is given to those who have proven themselves worthy of knighthood (or those wealthy enough to buy one...)! A truly horrific axe. Originally intended for cosplaying barbarians until it was discovered that it is a highly effective weapon. This dark sword is imbued with the power of DOOOOOOM! Don't worry, it will only curse its victims, not its wielder... We promise! Ah deadly nightshade with a touch of arsenic! Guaranteed to eat away at your enemies insides and outsides! Adrenaline courses through your veins! Restores your shield bar back to full!! Why are deities always tossing lightning bolts? At least this time they're throwing them at your enemies! 2x max weapon damage! Ignites the atmosphere around your foe and slowly burns it alive! Also works great for Barbeques! When adhesive bandages don't stick! Heals back 100% of your hitpoints! Two spaces in front of the full stop/commas, should only be one. Desc: This is the standard issue shield bearing the royal insignia of the Kingdom of Bladehaven. Desc: Members of the Bladehaven Royal Guard carry these powerful and ornate shields. Desc: Bladehaven's most elite warrior attain the rank of Paladin when they have displayed a mastery of both blade and magic. Desc: Paladin's who stray from the path of light become feared and corrupted warriors known as Doomknights! They carry these shields to strike fear into the hearts of their enemies! ~ The 'Desc:' might want to be removed as it is not apparent in any of the other shops. ~ 'Paladin Shield' might want to be changed to 'Paladin's Shield' as all the other Shield have the ownership ('s). ~ Another double spacing for the 'They' in the Doomknight Shield description. You can get health potions for 500 Gold Pieces!. Due to medicinal herb shortages, you may only carry up to three potions! Equips: Doomknight blade, Doomknight shield, Poison strike. marks that show where the claw, sword has hit still remain there. I don't exactly know if it is a bug or a cool effect but i just thought i would post. What happened after the bug: I withdrew the shield and it went back to normal and the fight continued.